PENNY SALE: Order an UNREAL GSM sim for a penny ($0.01)! Unlimited talk, text, and data starting at $10 per month. Select AT&T or Sprint service. I bought an UNREAL (AT&T) LTE GSM sim for a penny with free shipping, and used and tested it for free during the two week free trial period. I am now on the $10 per month *unlimited* plan (unlimited talk/text plus 1GB LTE data plus unlimited slower 2G data, plus free data rollover). The total cost is really only a penny to try it, and then only $10 per month (no tax or other fees) for the 1GB *unlimited* plan. 5. UNREAL Sprint vs AT&T Service: Which is better? 9. Tip: Try it on a spare/backup phone first! UNREAL Mobile is a new MVNO (Mobile Virtual Network Operator) offering Sprint-based service or AT&T-based service. The monthly pricing is simple and inexpensive, and there are no hidden charges or "gotcha" fees. For a flat $10 per month, you get unlimited talk and text, 1GB of high-speed LTE data, and if the LTE data is used up, you have unlimited slower 2G data. There is no tax, so the monthly total is $10. There are also more expensive plans that provide more LTE data (see pricing section below). All of the plans include free data rollover and banking. Each month, up to 500mb of any unused LTE data is automatically "rolled over" and banked for future use. The maximum amount that can be banked is 20GB. In addition, after 3 months of service, you get a 10% added to your high speed data amount every month as a loyalty bonus. The difference between the Sprint-based service and the AT&T based service is that the Sprint-based service has a "real" cellular phone number and you can use your phone's native dialer, but for the AT&T based service, the phone number is a voip number and you must use the Unreal app to for calling and/or texting. The great thing about Unreal is that the monthly pricing is simple and inexpensive. * For $10 per month, you get unlimited talk & text, plus 1GB of high-speed LTE data and unlimited slow-speed 2G data. * For $15 per month, you get unlimited talk & text, plus 2GB of high-speed LTE data and unlimited slow-speed 2G data. * For $20 per month, you get unlimited talk & text, plus 3GB of high-speed LTE data and unlimited slow-speed 2G data. * For $30 per month, you get unlimited talk & text, plus 5GB of high-speed LTE data and unlimited slow-speed 2G data. * There is NO TAX on any of the monthly plans. * Data rollover is included for free (up to 500mb of unused LTE data per month). * You can upgrade or downgrade your plan at any time if you want more or less data.
.* If you use all of your high-speed LTE data, you still have unlimited slower 2G data. * UNREAL has a 30 day money back guarantee. * With Unreal, there are NO overage charges and you never run out of data (although it will be slower 2G data if you use up your fast LTE data). * Service and coverage is provided on the Sprint network. * For Unreal Sprint service, you will need to purchase a phone from Unreal, or provide your own unlocked Sprint-capable phone (with a Sprint sim in it) and then sign your phone up with Unreal. * Talk & text is via a "real" cellular phone number and uses your phone's native dialer. You can also use the Unreal app to do wifi calling if you want, but any calls made with your phone's native dialer will be over traditional cellular service. * You can purchase a phone from Unreal, or use your own Sprint-capable phone (also referred to as BYOD or Bring Your Own Device). * If you want to purchase a phone from Unreal, they currently have a very limited selection of phones. * If you want to "bring your own phone", it needs to be Sprint-capable (CDMA), and it can't still be locked to any other Sprint MVNO. You can check if your phone will work on the Unreal Mobile website where you can enter your phone MEID or IMEI in their compatibility checker. * Service and coverage is provided on the AT&T network. 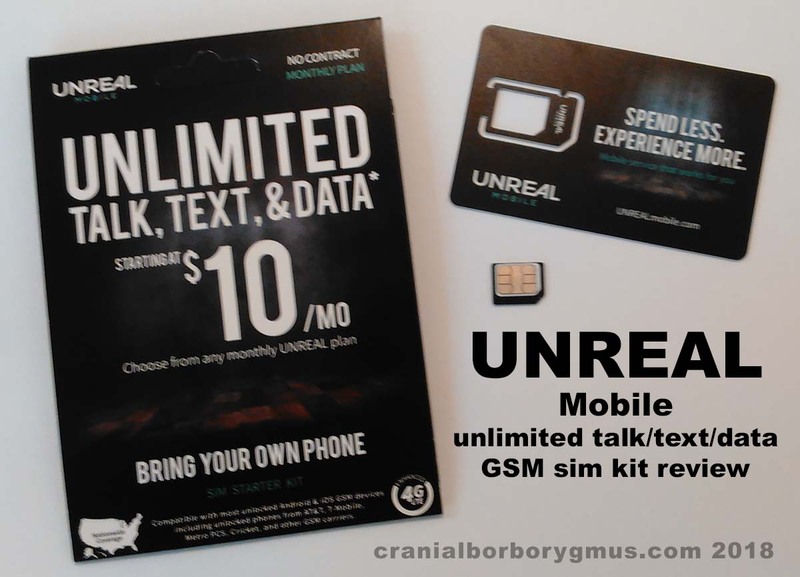 * For Unreal AT&T service, all you need to do is purchase an Unreal GSM sim (now on sale for a penny with free shipping) and then put the Unreal GSM sim in any unlocked AT&T or T-Mobile phone. Set the phone APN to get the cellular data, and install the Unreal app for talk/text (or use a Gooogle Voice number with the Hangouts app like I do). * Talk & text is via a voip phone number and you must use the UNREAL app to make calls and send texts. The app works for calling and texting on cellular and wifi. * You will need to provide your own unlocked GSM phone (i.e. AT&T or TMobile). It must be unlocked, although AT&T prepaid phones work without unlocking. * You will need to purchase a GSM sim from Unreal. After you put the sim in your phone, you will need to set your phone's APN to unreal.com.attz , and you will need to install the Unreal app for calling and texting. 5. UNREAL SPRINT or AT&T Service: Which Is Better? Which coverage is better in your area? Here in Santa Barbara, California, we have good coverage with Sprint and with AT&T. We actually have three phones using Sprint service, and they all work fine. We also have multiple phones using AT&T service (using the FreedomPop LTE GSM sim for free service), and the AT&T coverage is equally good. But if only one service provides decent coverage in your area, that's the service you should use. Sprint service is tied to the phone. You'll need to buy a phone from Unreal, or use your own Sprint-capable phone. If it's your own phone, you'll need a Sprint sim card for it. Sprint sim cards are device specific. It's not just the size of the sim card. A Sprint sim card for the Moto G4 may not work for the Moto G6 Play. That said, once you get a Sprint sim card, you can just leave it in the phone and it will work forever, even if you cancel or change providers. But if you want to change phones, you'll have to get the new phone's serial number and get your account updated to use it instead of your existing phone. The benefit for some people of using UNREAL's Sprint service is that the phone number will be a "real" cell phone number, and you can use your phone's native dialer to make calls. That said, you can only call and text when you have a cellular signal. If you want to call or text on wifi, you'll have to use the Unreal app. My main knock again Sprint service is that the service is tied to the phone, and I like having the flexibility of moving my sim card from phone to phone if I want to change phones. You can't do that with Sprint service. AT&T service is tied to the sim card. If you get the Unreal GSM sim, you can put it in any unlocked GSM phone (i.e. T-Mobile or AT&T). The sim card will work and you'll have service. You can switch between phones just by moving the sim card. I like that. The "downside" of the AT&T service, for some people, is that the phone number is a "voip" phone number, and you have to use the Unreal app to make calls and send texts. I don't mind this. I've been using a free Google Voice number with the free Google Hangouts app, which is voip, for several years, and it works fine. The benefit of a voip app (Unreal or Hangouts) is that you can make calls and text on cellular data or wifi, and I find the call quality to be just fine (and often better that a "real" cellular phone call). One thing to consider with a "voip" number though is that it may not work with Uber or Lyft, but I don't use those services. I like being able to switch phones, so I prefer the GSM sim. I also don't mind using a voip app, in fact, I find it beneficial to have the app on multiple phones/devices which will also work even without the GSM sim if the additional phones/devices are on wifi. Finally, the great thing about the Unreal GSM sim is that you can get one for $0.99 with free shipping. Stick it in a GSM-capable phone and try it out. You'll have 14 days to test it and see what you think. Change the default paid monthly plan from the $30 plan to the $10 plan, and then pay $10 to try it for a full month. If you like it, keep it and it's a flat $10 per month. * The ordering process is the same as with FreedomPop, for those people like me who have ordered sims from FreedomPop in the past. * First, you will need to enter your email address, zip code, and street address (you can leave the phone number blank). Use your real email address, since your order confirmation, account details, and account password will go to that email address, and you will need the password to log into your account. * Note that by ordering the sim, you will get a free 14 day trial, which starts 7 days after your sim ships. After the 14 day free trial, you will be billed for the $30/month 5GB plan. You can switch to the cheaper $10 plan before then, which is what I intend to do. * After you've ordered the sim and picked a phone number, you will get an offer for a SECOND SIM for another penny. I would skip this offer, unless you really want a second sim, which will also have a monthly paid plan attached. Don't get confused and buy the second sim unless you really want it, and you are willing to also pay for a second monthly plan. * I placed my order this morning (Tuesday, Oct 2) around 9am PST, and then logged in and checked my account this afternoon and saw a message as of around 3pm informing me that my sim has shipped. So in my case, my sim that I ordered in the morning shipped on the same day. I am guessing that it is coming USPS First Class mail (no tracking number). * I checked my account's billing section after seeing that my sim had shipped, and see that my first monthly cycle will be charged on October 23, which is in 21 days as stated in the offer terms (7 days after shipping plus the 14 day trial). And as I already stated, I will switch to the $10 plan before then. * My impression so far... ordering is easy. All you pay is a penny. The future pricing is very straightforward. Although the default plan is $30/month, it should be easy to change it to the $10/month plan. Everything is included, including voicemail and data rollover. There is no automatic "auto top up" to worry about. When your fast LTE data runs out, you get unlimited slow 2G data, although if you want to or need to, you can add (buy) extra data for the month, or just change to a monthly plan with more data. * I also noticed there is an option to move a FreedomPop phone number to Unreal, which might be useful to some FreedomPop users. I might try the process (it's free) with an old unused FreedomPop Global sim number that I have just to see how it works. It's listed under [Devices] and is called [Migrate FreedomPop Number]. * I received my new Unreal GSM sim card today that I ordered three days ago. It came in the mail. It was sent in a regular white envelope with a USPS First Class postage label on it. It shipped from Poway, California. * I opened up the Unreal sim kit, popped out the sim, and stuck it in my ZTE ZMAX 2 (an unlocked AT&T prepaid phone). I changed the APN setting to unreal.com.attz Cellular data then worked, with a strong AT&T signal, as expected. * Next I installed the UNREAL Mobile app from the Google PlayStore. When I first tried to install the app, I got an error message saying "Can't install app (Error code: 505)" I remembered reading that if you have the FreedomPop app on your phone, you need to uninstall it first, so I uninstalled my FreedomPop app, and the Unreal app installed just fine. * I then proceeded to turn off my wifi so I was on Unreal cellular data, and made a few test calls. The calls worked and the quality was fine. I then sent and received a couple of SMS texts and MMS text, all of which worked. I then went back on wifi, and made more test calls and sent more texts. Everything works fine, as expected. * I like the Unreal app better than the FreedomPop app. It's clean and easy to understand. I'll post some screenshot when I get time. * I intend to use the Unreal sim in my ZTE ZMAX 2 phone for a few days, then I'll switch to a different phone, and then I'll have my son use it for a while in a spare BLU R1 HD phone we have. * At this point, the Unreal GSM sim is performing as expected, and the Unreal app seems even better than expected. If you're willing to spend $10 per month and you know you have good AT&T coverage in your area, the Unreal GSM sim seems like a great way to go. And you can try it for 21 days for a penny. The UNREAL GSM sim kit ships with the free shipping option via USPS First Class mail (no tracking number) from Poway, California, and should arrive 3-5 business days after you order. Your free trial period lasts 21 days beginning when your sim gets shipped (7 days for shipping in transit plus a 14 day trial). This means you will be billed for your first month of service 21 days after your sim ships. You can confirm this on your Unreal account under the billing section. You can downgrade from the $30/month trial plan to the $10/month plan at any time, but you need to do it before your 21 days are up or you will be billed $30. * I've been using the Unreal GSM sim for three days now. It works, and works well. I've made and received several phone calls, including talking to my father for over an hour while I walked around the neighborhood. The call quality is good, and often is even landline quality (we have good AT&T LTE data coverage here). I've also sent and received numerous SMS and MMS texts. I like the Unreal app. * Speedtest.net results: I ran a SpeedTest yesterday and got the following: [10.1 MBPS download, 2.95 MBPS upload]. I just ran another SpeedTest now and see: [10.6 MBPS download, 2.90 MBPS upload]. The AT&T LTE data is plenty fast. * Transferring over ("migrating") a FreedomPop phone number to Unreal is amazingly easy! I noticed a setting to "Migrate FreedomPop Number" so I decided to try it to see how well it works. I transferred (ported?) over a FreedomPop Global sim phone number that I like better than the phone number I got when I signed up with Unreal. The transfer process was simple and instant. First I logged into my Unreal account and went to ""Migrate FreedomPop Number" under DEVICES. It asked for my FreedomPop phone number and a pin number. I had to log into my FreedomPop account and get the pin number, which required going to "my.freedompop.com/settings/port-out-info" and generating a new pin number (tip: enter a 4 digit number and click the green check mark, and the system will update all the info with a new pin number). Once I entered my FP number and port pin on my Unreal account and clicked transfer, it did it in about two seconds. I got a message telling me "Transfer Status Congratulations! Your FreedomPop number has been transferred to your UNREAL account", and also informing me that I would need to re-sync my Unreal account. Sure enough, I opened the Unreal app on my phone, and got a message saying "Phone Number Changed. Your phone number is no longer valid. Please sync your account data." I clicked "Sync Account" and my number was updated to my old FreedomPop Global sim number. So now my global sim number is on my Unreal account, and there is no number on that Global sim account (which I then closed). I was frankly surprised at how easy it was to do. Two thumbs up to Unreal on the process! The UNREAL GSM sim card kit is a 3-in-1 card (or "3 cut" card), meaning you can pop out a full size sim, a micro size sim (shown above), or a mini size sim. * I put the UNREAL sim in a spare BLU R1 HD phone that we have, and set the APN to "unreal.com.attz" and installed the Unreal app from the Google Play Store. I then asked my teenage son if he'd like to test it out for a while, which means he will now have cellular data (and lots of it during the rest of the 14 day trial) for checking snapchat and other things. He jumped at the chance and has been using the phone and sim for the past two days. It is working fine. His first comment when he called me on the phone was that he was surprised how clear the call was (his own phone is an old Moto G (1st gen) with Sprint talk and text only, no data). Anyway, the Unreal GSM sim continues to work just fine, as expected. The UNREAL Mobile app works well. The bar at the top of the app has five icons/buttons: (1) home (2) texting (3) calling (4) contacts (5) voicemail. The homepage shows you how much data you've used, when your next payment is due, and has links for your different account tabs. * My son and I have been using the Unreal GSM sim for about two weeks now. My son is using it now, and he is mainly using it for data (Pandora and SnapChat), though I have him continue to text and call occasionally with the Unreal app to confirm it continues to work. Everything is working as expected, and my son likes having the cellular data. I've got three days left on the free trial. I'll probably change to the $10 plan this weekend so I don't get charged for the $30/5GB plan when the trial ends. I'll update this post again after that. At this point I am quite happy with Unreal. I only paid a penny to try it, and it works as advertised. I just need to confirm that "downgrading" to the $10/1GB plan works. I'll also be curious to see if I get 500mb of rollover data from the trial period, which would mean I have 1.5GB of LTE data for the first month. * I had a day left on my free 14 day trial (actually, it's 21 days but it takes a couple of days to get the sim), so I decided to switch from the default $30/5GB monthly plan to the $10/1GB monthly plan before I get billed for my first monthly plan cycle tomorrow. Switching plans was simple. I just went to the "plans" tab, picked the $10/mo plan, and clicked activate. I expected the change to be instant, and that I would lose the remainder of my 5GB of trial period data. Instead, it appears I am still in the trial phase, and my new plan will still start tomorrow, and it will be $10 instead of $30. I confirmed this by checking my "billing tab" and now I see the pending charge for tomorrow (Oct 23) is now $10 instead of $30. 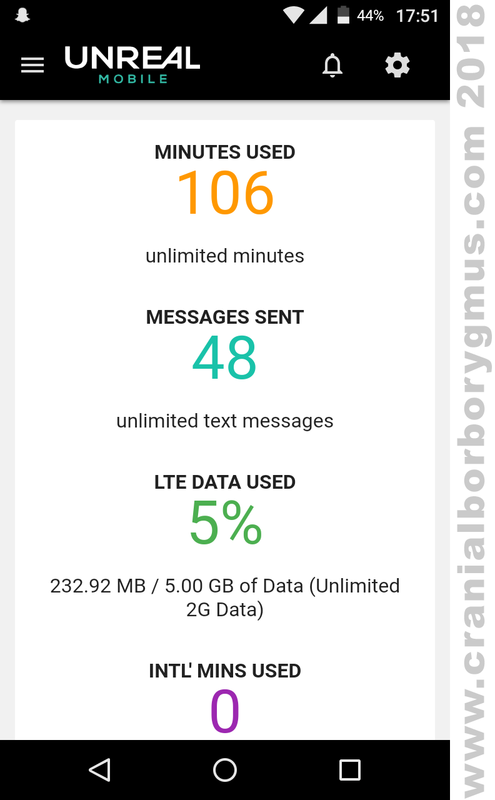 So I still have less than a day left of the trial period, plus all the remaining amount of the 5GB of trial period data. I will post again tomorrow to confirm I am billed $10 and that I am on the $10/1GB monthly plan. * This morning I checked and I was billed $10 as expected, and I am now on the $10 per month plan. So my total costs so far have been only a penny to get the Unreal GSM sim and try it for two weeks, and now a flat $10 per month (no tax) for the Unreal $10 per month 1GB *unlimited* plan. I was also pleased to see that the free data rollover service is working. My son and I only used about 500mb of the 5GB of free trial data, and so 500MB of unused data got rolled over for free and is now showing on my account. I now have 1GB of monthly data plus 500MB of "rolled over" data, or 1.5GB total available. * My son continues to use the Unreal GSM sim in our BLU R1 HD phone, and it continues to work fine, as expected. I am thinking about moving the Unreal sim to an iPhone 6 that we have, and then I'll continue to have my son use it with the iPhone so we can see how it works in an iPhone. The Iphone 6 has a partially shattered screen which is why we don't use it a lot, but it will be nice for testing the Unreal GSM sim on an iPhone. * We moved the Unreal sim to an iPhone 6 Plus this past weekend. Setting up the iPhone was simple. To set the APN, we just went to unreal.com/iosapn using Safari (on wifi) and followed the instructions to set the APN. After doing that, we verified that cellular data was working. We then installed the Unreal app so we could use the Unreal phone number for calling and texting, and discovered that installing the Unreal app would have also set the APN. In any event, setting up the iPhone was simple, and my son have been using it for several days. The Unreal GSM sim works fine on the iPhone. * My son continues to use the Unreal sim in the iPhone, and it continues to work fine. We just started the second billing cycle, and were charged $10 as expected. My son didn't use all his data this past cycle, and so another 500mb of unused data was rolled over. So we now have 1GB of monthly data plus 1GB of rollover data, or 2GB of total available data. The free included unreal data rollover service works great! * My son went back to using the Unreal sim in our BLU R1 HD phone, since our iPhone with the cracked screen started acting up. The Unreal GSM sim continues to work fine. My son is mainly using it for the data. We just started the third billing cycle, and the monthly bill remains a flat $10 bucks. We received another 500mb of rollover data this cycle, so we now have 1.5GB of accumulated rollover data. All is well, and I continue to recommend the Unreal $10 per month plan, especially if you just use the AT&T LTE data and use a free Google Voice number with the Google Hangouts app for free talk & text. * My son continues to use the Unreal sim, and it continues to work fine. Rollover continues to happen, and since he always has some of the 1GB of new monthly data left over at the end of the month, he keeps saving and banking more rollover data. I've been meaning to test the 2G data speed, and finally decided to use up all of my LTE data (including rollover data) so I could see what happens when you run out of LTE data. I also wanted to verify if the LTE data was still as fast as when I signed up in October. 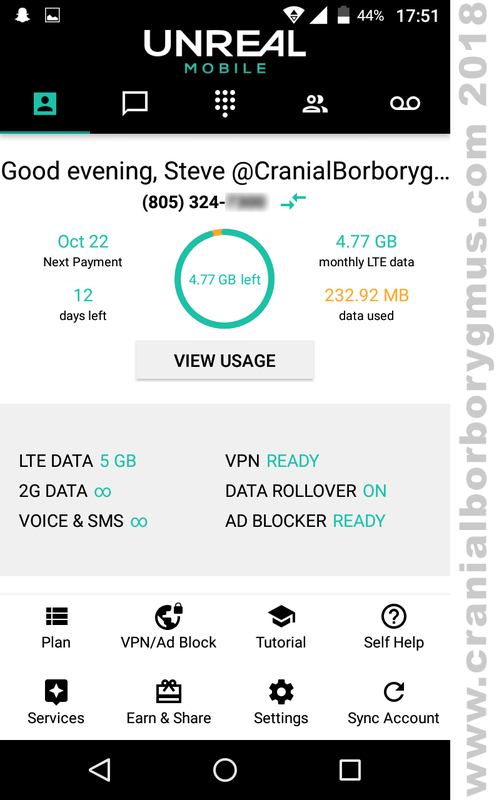 So I temporarily put my son on a FreedomPop sim I have and took his Unreal GSM to use up all the LTE data on the account "(it will reset with another 1GB of new LTE data in about a week). I ran a lot of Speed Tests to burn up the LTE data, and found the results were still the same as last October. The download speed is around 10mbps (the range was 10.2 to10.6mbps) and the upload speed is around 3mbps (the range was 3.01 to 3.38mbps). When the LTE data was used up, my data slowed down but stayed on. It was still showing as an LTE data signal on my phone, but the speed was reduced. I ran several Speed Tests and got a download speed of .26mbps (every test). The upload speed varied but was always a little faster (about .35mbps). I'm guessing it takes a moment for the throttling to kick in when you are uploading. In any event, I can report that my 2G data speed was consistently .26mbps. More importantly, I tested sending texts with Unreal and had no problem. I also made several voice calls on the "2G" data and it worked, which was a pleasant surprise. Apparently the throttled "2G" speed is still enough to support clear voice calls, which is good. I also used Google Maps and was able to check local traffic. It was a little slower to load than normal, but still quite usable. Unreal LTE data speed vs throttled "2G" data speed. 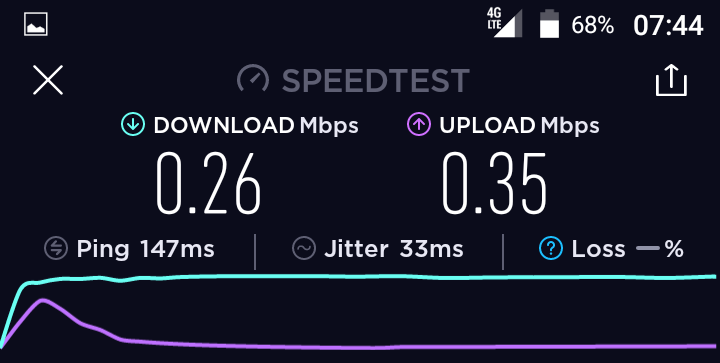 The Unreal "2G" data speed was 0.26mbps. You will need an unlocked GSM-capable smartphone (i.e. one that works with AT&T or T-Mobile). And actually, even locked AT&T pre-paid phones work. Most smartphones today are GSM-capable and will work, you just need to make sure your phone is not still locked to Verizon, Sprint, or T-Mobile, for example. The Unreal GSM sim is a 3-in-1 sim. That means you can pop the sim out as a full-size sim, or a micro-size sim, or a nano-size sim, depending on which size sim your phone requires. To set the APN on an Android phone, go to [Setting] and select [Mobile Networks] and then [Set APN] and enter a name (i.e. Unreal) and APN (unreal.com.attz). Then save and use the new APN. The process should only take a few seconds and is simple. There are also instructions explaining this on the sim packaging. To set the APN on an iPhone, open the Safari browers and go to unreal.com/iosapn Then follow the prompts to set the APN. Again, if you only want to use the UNREAL cellular data, all you have to do is set your phone's APN to unreal.com.attz YOU DO NOT NEED TO INSTALL THE UNREAL APP TO BE ABLE TO USE CELLULAR DATA. You only need to install the Unreal app if you want to use the Unreal number for talk and text. If you want to use the Unreal GSM sim for calling and texting with your Unreal phone number, then you will also need to install the Unreal Mobile app from the Google PlayStore. The app will also allow you to access your Unreal account to check your data usage and other things. Q: How long is the free trial? A: When you order the GSM sim, you agree (by checking the box accepting the terms and conditions) that you will have a free two week trial, and then you will be billed for the monthly paid plan (at this point, it is the $30 plan). The free two week trial starts 7 days after your sim ships, but you can start using the sim as soon as you get it. Based on my experience, the sim will ship the same or the next business day, so your first monthly bill will be due about 21 days after you order the sim. You can confirm this by checking your account under billing. At any time during the trial period, you can change your plan to the $10 plan (or any other plan), or you can cancel your account. Whatever you do, do not just order the sim and forget about it. If you don't do anything, whether or not you ever even receive the sim and/or whether or not you ever even use the sim, you will be billed approximately 21 days after you order. So wait until you are ready to use the sim before you order it. Q: What kind of phone do I need for the Unreal GSM sim? A: You can use any (GSM-capable) unlocked smartphone running Andoid 4.1 or higher or iPhone iOS 8.2 or higher. Although technically the phone needs to be unlocked, I have found that locked AT&T prepaid and postpaid phones work with the Unreal sim (I think because the Unreal sim uses the AT&T service). However, if your phone is locked to an AT&T MVNO, I don't think it will work, and if your phone is locked to Sprint, Verizon, or T-Mobile, the Unreal sim will not work. I have used Unreal sim and app successfully in the following phones: an unlocked ZTE ZMax2 AT&T "GoPhone" (AT&T prepaid phone), a still locked ZTE Maven3 AT&T prepaid phone, an unlocked Moto G4, an unlocked Moto G5 Plus, and an unlocked Amazon BLU R1 HD. Q: Can I switch from FreedomPop and keep my FreedomPop number? A: Yes. Order a new Unreal GSM sim. You can get a new number with it if you want. When you log into your Unreal account, you will see there is the option to transfer your FreedomPop number to Unreal. I did it with a FreedomPop Global sim number that I wanted to keep (see the "my experience" section above for details). The process is simple and takes a minute or two, and becomes effective immediately. Q: How fast is the unlimited Unreal 2G data? A: Short answer, 0.26mbps. Longer answer, per my February 14, 2019 test above, after I intentionally used up all of my LTE data (I used it up on purpose to test the 2G speed), the 2G data speed was 0.26mbps. The data was still coming from an LTE data signal, but must have been throttled to slow it down to 0.26mbps. In any event, I tested texting, calling, and checking Google Maps traffic, and the data worked, though the map/traffic loading was a bit slower but still usable. Most importantly, I was happy to confirm that voice calls were still clear on the throttled "2G" data. 9. TIP: Try it on a spare or backup phone first! I tend to be a cautious person, which is why I like to try something first before I fully commit to it. I recommend that you do this with the Unreal GSM sim, especially because you can try it for up to three weeks for only a penny. Don't put it in your main phone right away, and don't port over your existing number right away (if ever, and then consider porting to google voice instead if you want more flexibility). Try the Unreal GSM sim in a spare/extra/backup phone first. You may already have a spare smartphone lying around (I have half a dozen at least). If you don't have an extra phone, you should get one. Assuming you have wifi at home, having an extra smartphone around is a good idea, regardless of whether or not you have a cellular plan for it. Get a free Google Voice number and install the hangouts app on it, and you'll have a totally free "wifi only" phone, which you can use when you don't want to give your "real" number out to avoid excessive marketing/spam calls. If you need a spare/backup smartphone, it's surprising how inexpensive a decent smartphone can be now, especially if you'll consider a "pre-owned" phone and realize that you don't need a flagship phone for a backup phone. Here are a few sources for inexpensive backup smartphones. * Save on Amazon Prime smartphones - If you are an Amazon Prime member, you can get a discount on a wide variety of "Prime Exclusive" unlocked smartphones. In the past you could save $50-$100 or more by getting the Amazon version, and in exchange there was an Amazon ad on the lockscreen that you saw whenever you turned the phone on. Amazon removed the lockscreen ads earlier this year, but now you don't save quite as much (savings are typically $20-$50). Now, the Amazon-version phones only have a few Amazon apps installed on them. You can't remove the Amazon apps, but it you want, you can disable them, and you'll never know they are there. I have two "Amazon version" phones, a BLU R1 HD phone and a MOTO G5 PLUS phone. On both of them, I've disabled the Amazon apps, and one would never know the phones had anything to do with Amazon. Buying an Amazon-version phone is an easy way to save a bit and get an unlocked smartphone (though the phone will have a couple of Amazon apps that you can't remove, but you can disable). * Save on phones at swappa.com (used but good condition phones at great prices) - I just recently finally checked out Swappa, although I've heard about it for several years. Swappa allows people to buy and sell (swap) their phones. It seems like a friendly-version of a cross between ebay and craigslist. I'd be nervous about buying a used phone off of ebay, but for some reason, I trust the sellers on swappa. Each listing has lots of pictures documenting the condition of the phone. I just bought a MOTO G5 PLUS phone for $105 with free shipping and no tax (original retail was $229). Although the phone is a year old, it is in excellent condition and works great. If you're willing to get a "pre-owned" phone, you can save a lot. It's definitely a great way to get a decent, inexpensive backup phone for testing the Unreal GSM sim. UNREAL Mobile is a new spin-off of FreedomPop, which is how I heard about Unreal. I've been getting free phone service from FreedomPop for two years. It's not necessarily easy to get and maintain free FreedomPop service, but I've enjoyed the challenge and reward. With FreedomPop, you really need to pay attention and know what you're doing, and you need to know "how to play the game". FreedomPop service can be free (after you pay a few "set-up" costs), but it's increasingly limited, the rules are regularly changing, confusing, and a bit complicated, and one can legitimately wonder if they are going to get an unexpected charge for some new catch on each new monthly bill. Unreal is the opposite of FreedomPop. Although both companies are owned by the same people, I think there is a HUGE difference between FreedomPop and UNREAL. FreedomPop is a "freemium" provider that offers limited *free* service and then tries to up-sell you with paid services. For example, FreedomPop gives you 200 voice minutes for free, but not voicemail. If you want voicemail, you need to pay for an "add-on" service. And because FreedomPop is sometimes a bit deceptive on the up-selling, they get a lot of bad reviews from people who feel they've been taken advantage of with "unexpected" charges. That said, as I said above, I've been successfully using FreedomPop for two years and have gotten free service the whole time, and have never gotten any "unexpected" charges. I also know many other people have successfully used FreedomPop for free service for even longer. But you need to know what you are doing if you use FreedomPop's "free" service or you can and probably will get hit with "unexpected" charges. UNREAL is refreshingly different from FreedomPop. I think FreedomPop is leveraging its experience, technology, expertise, and business connections to create a new low-cost provider company that charges the lowest (reasonable) price possible, but doesn't pretend to offer "free" service. As such, with UNREAL, you pay $10 per month, and you get unlimited talk and text, and voicemail is included free. You also get 1GB of high-speed LTE data, and if that runs out, you get unlimited slower 2G data for the rest of your monthly cycle. You never run out of data. Whereas FreedomPop would try to charge you for various add-on services, UNREAL includes free voice mail, free data rollover (up to 500mb per month), and several other free features. If you're willing to pay $10 a month (and I don't think you'll find anything else like this that is this cheap), Unreal is a good way to go. If you have good AT&T coverage where you live, I recommend the Unreal Mobile GSM sim $10/month service. You can try it for a couple of weeks for only a penny. You can then keep using it for only $10 per month. If you don't like it, you can cancel at any time. It is definitely worth trying. I want to emphasize that you should try it first. I would not port my existing phone number over right away, and I would not use it with my existing main cell phone. I would try the Unreal sim in a backup or spare phone first to make sure it works for you. I also prefer to use my Google Voice number and the Google Hangouts app for talk and text, and just use the Unreal service for the AT&T cellular data, but for people who do not have or do not want to set up a free Google voice number, the Unreal Mobile app works well for talk and text, at least per my experience and my son's experience. Hi, does the $0.99 SIM come pre-activated like they do on FP, or can I wait to activate it when I need it? Hi Dante, Good question. The Unreal GSM sim activation policy is similar to FreedomPop but not exactly the same.. The sim automatically activates 7 days after its ship date, and then your 14 day trial starts. * So you have 21 days after it ships before you get billed for the first month. In any event, you should wait until you're ready to try the service before you order. *From the Unreal offer page terms:: "Your UNREAL service will not begin until 7 days after your device ships. Your subscription includes a 14-day(s) free service trial. At the conclusion of your free trial, your service will automatically renew at the provided [monthly] rate found in your shopping [unless you change to a different monthly plan before then]." Thank you so much for your UNREAL Mobile review. This is by far the most clear and detailed instructional and informative review of UNREAL Mobile. I got better understanding from this review of how it works and what to expect than from UNREAL's website and other so called techie/professional reviewers. Hi Joel, Thanks for your comment and feedback! I think it's actually a good idea that you didn't port your numbers over (at least yet). Much better to get the Unreal sims and try them out during the 2-3 week free trial period and make sure the service works for you. If it works, then you can decide whether to just stick with the new numbers, or port your existing numbers over, and then also cancel your old service. Feel free to let me know when you get the sims and what you think. How does Unreal Mobile $10/month service compare to Freedompop basic free service with $10.99 now $12.87/month premier service. Thank you in advance. Nice review. Hi Rich, Good question. I think the Unreal pricing is much better than the FreedomPop paid plans, and is some of the best pricing available in the industry. I've always thought the FreedomPop paid plans were over-priced and not a great value (actually, kind of a rip-off really) because FreedomPop had to overcharge its paying customers to make up for all of the freeloaders (like me). Anyway, with Unreal for $10 a month, you get unlimited talk and text (must use their app though) and 1GB of high speed AT&T LTE data, plus unlimited slower 2G data if you run out of the high speed LTE data, plus free voicemail, plus free data rollover (up to 500mb per month). With FreedomPop, you'd have to pay $22.99/mo to get their talk/text/1GB data plan plus $7.99/mo for their "Premium Plus service" to get voicemail and data rollover, or $30.98/mo total to get the same thing you get from Unreal for only $10. Also, with FreedomPop if you run out of high speed data, you get charged for top-off data or your account gets suspended until the next cycle, but this never happens with Unreal because you have unlimited slow 2G data (and you can buy more LTE data if you really need it, or just bank it with the free rollover service for months when you need more). The FreedomPop free plan (with all of its limitations, restrictions, catches, and stress) may still work for some people, but for anyone willing to pay, Unreal's paid plans are much, much better than any of the FreedomPop paid plans, in my opinion. Thank you for the opinion. I'll give it a try. Hi Steve. I emailed you once before about Unreal's BYOD Sprint service. I'm happy to report that they sorted out the outbound cellular dialing problem within a couple of weeks. I was only able to place calls over VoIP with their app at first, but it's now been fixed and working perfectly ever since. I'm very happy with the Sprint service and don't see myself switching, even though I prefer the portability of an AT&T SIM. So, my question is more a point of curiosity: How is the call quality after you hit your unthrottled cap? I would assume that AT&T prioritizes Unreal VoIP calls so that the phone service over their data network doesn't become useless once you're throttled. I would also assume that they have no reason to, and therefore don't, prioritize other VoIP apps like Hangouts Dialer, Skype, etc, so I'm curious how their call quality holds up at that point too. *IMHO 2G voice channel is far more more reliable than VoIP if your signal is weak or you're outside of AT&T LTE coverage areas. I've been a Google Voice user for many years, and I simply don't trust VoIP for important calls, especially on the highway outside of immediate metro areas. Of course, AT&T's network is more robust than Sprint's, so that's definitely a mitigating factor. *My native phone dialer seems to integrate with my car's bluetooth better than the Google Voice hangouts dialer, and Google Voice caller ID never seemed to integrate with my contacts list. So, unless I recognized an inbound caller's number, I wouldn't know who it was until I picked up. *One negative about Sprint is that you lose access to Sprint's data network during a call and is true of any service on Sprint or Verizon. This doesn't strike me as a huge drawback, but maybe it is for some. Of course, if you're on Wifi during a call, you'll still be able to use that. Also, if you use Sprint's Unreal VoIP service, I think you should still be able to use both at once, though who knows if your call quality will still hold up if you tried. With any GSM service, you can place calls and use data at the same time, even if you're not using a VoIP MVNO like like Unreal Mobile. Hi Rich, Thanks for your epic comment! Good to hear about your experience on the Unreal Sprint BYOD program, and that it is now working for you. Thanks for sharing your experience and insights. You make good points and ask good questions about the Unreal GSM service and voip talk/text app, though I'm not sure how well I can answer them at this point. As for voip voice quality, I've been using a free Google Voice (voip) phone numbers with the Hangouts app for about two years (utilizing a combination of wifi and FreedomPop GSM LTE AT&T data). I am very happy with Hangouts, especially since it is free, and I can answer the same number on multiple phones, and have multiple numbers ring to the same phone (I have multiple numbers, and several phones that I switch back and forth between). We have cable internet at home, and I've always found the call quality at home to be like a landline. Similarly, the FreedomPop/Unreal GSM AT&T LTE local coverage here is good, and talk quality around our neighborhood and locally is still like a landline. For me, FreedomPop and/or Unreal voip voice quality is generally actually better than our Republic Wireless Sprint cellular phones. So I think when you have a good wifi signal, or a good 4G data signal, voip is actually clearer and better than cellular. But I would advise everyone to try it for themselves in their own area and see what they think. You raise a good question wondering how the voip quality will be on slower throttled 2G data. I don't know yet, because we haven't managed to use up all of the 4G data yet. When we do, I'll have a chance to test it and find out. I would guess it might not be so good. But another thing for me is that I text more than I call, and when I do call, I'm usually on wifi, so voip data voice quality is not a huge factor to me, even though it has been fine so far. As for hooking the Unreal app (and/or Hangouts) into your car's system via bluetooth, I know readers have reported problems and issues. I've never had a car with bluetooth until recently. We just got a car week ago that has bluetooth, so now I'll be able to test it when I have time (or more likely, I'll have my teenage son set it up and test it). Thanks again for commenting and sharing your experience! This offer came at a time when my wife went into the hospital. It was about all I could afford. Thank you very much. Hi Clifford, Thank you for your comment. I hope your wife is doing better. Hi! I loved your in-depth review. I have unreal right now and I would rather have my native messaging and phone app to be used to place calls and texts but the unreal app might have some getting used to. The service is great so far but I feel like with all the permission I give the app, it may drain my batter a bit quicker. Since its VOIP, i can be in airplane mode but still use unreal app via wifi which can save some battery. Hi Vith, Thanks for your comment, and for sharing your own experience with Unreal so far. I haven't noticed that the Unreal app has any negative effect on battery life on any of the phones I've tested, but maybe it does for you. You are correct that with Unreal for talk/text you have to use their app and not the native phone apps, and it might take some getting used to. As for Google Voice, I have an article on how to get a Google Voice number and then how to set up the hangouts app. It's pretty simple, and you can have the hangouts app set up on multiple phones and they will all ring when you get a call. If you rely on a Google Voice number and Hangouts, then all you need it a data connection for your phone (either wifi and/or cellular data). I've used Hangouts for a couple of years now, and like it because I have several phones and can grab anyone of them when I go out. I can also have Hangouts ring for multiple incoming numbers on a single phone (i.e. my personal number and my work number). But with Hangouts, you do have to use the Hangouts app for talk/text, not the native apps. I'm used to it and don't mind, but maybe others would. It's worth try I think, especially because it's free to get a Google Voice number. Thanks again for commenting! One follow-up on my previous comment - I got a new Pixel 3 XL on Black Friday as a replacement for my original Pixel XL. I commute on my bike to work and get caught out in heavy downpours occasionally, so I wanted the piece of mind of a waterproof phone. Unreal doesn't have the IMEI's for the newest phones in their database, so you need to call to have your service activated. Why their online portal says the IMEI is invalid but their phone support shows it as ready to activate, who knows, but you'll have to call in to get your service working for the latest Sprint-compatible phones. The process is pretty easy, however, at the end of the call they inform you that the transfer will take...ready for it...3-4 DAYS! LoL. So, add that as a point in favor of Unreal/AT&T GSM service. My primary number is a Google Voice number, so I probably should have just canceled my old Unreal service and started new service on the new phone. I suspect that I could have activated it immediately, but who knows, maybe any service changes over the phone are subject to the 3-4 day waiting period. I'll report back to let you know how the service transfer goes. Hi Rich, Thanks for the follow-up report, and congrats on your new Pixel 3! Thanks also for giving an example of how your Unreal Sprint service is tied to your phone, so changing to a new phone is a bit of effort (apparently especially on brand new model of phone if the IMEI isn't in the Unreal/Sprint database). However, if you had the Unreal GSM (AT&T) service, you could just move the Unreal sim from the old phone to the new phone and be done. I hope the transfer doesn't take the full 3-4 days, but I wouldn't be surprised if it did. I've read of quick transfers, as well as transfers that seem to take forever, though I think this can happen with almost any carrier. I would think because this is Unreal to Unreal, it should be quick, but because it also involves Sprint, who knows... Thanks again for all your comments and reports! I'm currently using a Freedompop data-only SIM to provide a hotspot in my Audi. I'm on the free plan with 200MB + 50MB friends and I'm paying $3.99 for monthly rollover. FP just started charging everyone (free & paid) a $2.99 monthly Administrative Fee "to help defray various costs incurred by FreedomPop". At $7 total per month, FP is not too bad for the limited amount of data I use for a hotspot in my car. Still, 10 bucks for 1GB a month and no hassles is an attractive alternative. Does Unreal offer a data-only SIM like FP does? Or will their 3-in-1 be accepted by my Audi which uses AT&T 3G service? I wish Unreal had an online chat to answer these questions. Hi Paul, FreedomPop and Unreal are essentially the exact same AT&T service. If your FreedomPop sim is working for you in your car, the Unreal sim should work exactly the same. You will just need to use the Unreal APN [unreal.com.attz] instead of the FP APN [fp.com.attz]. All their sims are data sims. The "data-only" sim just doesn't have a voip phone number attached. With the Unreal (or FP) sim that also has a voip phone number, you can just ignore and not use the phone number. The data still works just fine whether or not you use the phone number. And if you aren't using the phone number, you don't need to use the Unreal (or FP) app. Just set the correct APN on your cellular device and your data will work. Unreal servce is a flat $10 per month for 1GB of LTE data. In addition, I recently tested and verified that if and when you use up your monthly LTE data, you then get unlimited 2G data (which is really just the same LTE data but throttled to slow it down to 2G speed). So with Unreal, you never run out of data, which is very nice, and you don't have to worry about the FreedomPop "Automatic Top Up" games. I'm half contemplating switching over to Unreal from FP because the $10 per month for 1GB LTE and unlimited 2G sounds like a bargain. However, in my free annual plan for FP, there is a promo offer for an annual plan of 1 GB a month for $50, leaving it at a cost of roughly about $4-5 a month. I have no additional fees (No administrative fees or anything similar yet) so that would be my monthly cost if I were to upgrade. This makes me hesitate between the two. How would you compare the Unreal $10 monthly plan to the FP promo annual plan? Hi Alan, If you're ok with spending $10 per month, I think the Unreal deal is much better than the FreedomPop paid annual plan. You don't have to worry about all the FreedomPop tricks, catches, and games, and you never run out of data. With Unreal, if you use up the monthly 1GB of LTE data, you get unlimited 2G data for the rest of the month. More importantly, there is no "auto-top-up" to worry about, and your account won't get turned off if you run out of data. And if after a few months, you don't like Unreal, since it's month to month, you can cancel any time. If you pay in advance for a year with FP and you later cancel, you don't get any money back. Do you have a comment or question? Would you like to share your own experience with UNREAL Mobile?